SOMEWHERE BETWEEN ZERMOTT AND ST. MORITZ, SWITZERLAND: I love trains. Some of the happiest days of my life have been on trains. When I was 5 years old, my mother and I took a train trip from Memphis to Little Rock. I cannot recall why we made the trip. What I do recall is that it was a grand adventure, and I enjoyed every minute of it. When I was 8, my father and mother and I took a train trip from Los Angeles to San Francisco. We had lunch in the dining car, and I still remember the meal. My mother and I shared an open face roast beef sandwich. The beef was hot and immersed in a mashed potatoes pool filled with gravy, and was served on real china with real silverware on a linen tablecloth. It was the most elegant meal I had ever experienced and remains so to this day. I once spent an entire summer on trains. It was the summer between my college graduation and starting law school, and I had a three month Eurail Pass that gave me unlimited train travel throughout Europe. If it was Tuesday, it must be a train in Belgium. When Claudia and I were married 35 years ago, we took a train from Atlanta to New Orleans for our honeymoon. And it wasn't just any train. It was the Southern Crescent, the classic and perfectly-named train that traversed a beautiful railway arc from Washington, DC to the Big Easy. And today, I am experiencing another joyous railway experience, this time with my bride and two Haltom kids aboard the appropriately-named Glacier Express, arguably the most famous railway in the world. The Glacier Express proudly advertises itself as "the slowest express train in the world," and thank God for that! 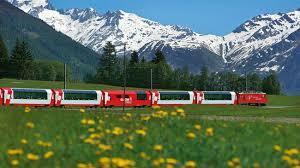 The Glacier Express is classic proof of the old adage that the journey is more important than the destination. It takes over 8 hours to make the glacier-pace trip from Zermott to St. Moritz, and believe me, if you are fortunate enough to be on board, it will be 8 of the best hours of your life. I can't begin to describe the breath-taking views of the Alps from the Matterhorn to Piz Bernina, as you travel over 300 kilometers across 291 bridges and through 90 tunnels. I believe all agnostics and atheists should be required to make the trip, and at the end state whether they still doubt the existence of a God who created such an incredible planet. But whether you are a believer or not, traveling on the Glacier Express is a spiritual experience...a true mountaintop experience that makes you simultaneously realize how insignificant you are and how you are blessed to be a part of a significant universe. A beautiful destination awaits me at the end of the Glacier Express line...a charming inn in the Engadine Valley where the Haltom family will spend a couple of days hiking through the majestic Swiss mountains. But at the moment, I do not want this journey to end. dissertation help: Train trip is the real amazing one for the people as it leads for knowing much more details. The fun and excitement completed during such visit and lot of happier moment comes here. Many people love to use dissertation help as it resolves many problems. tutuapp for ios: I know that you are quite excited to download TuTu App on your Android and iOS devices but before that let us know what’s so unique about this amazing app.